Bassam Chahine at Merle Wood & Associates sends word of a €1.1 million price reduction on the 44m motor yacht Lady Sheila. Built in 2009, she is one of Benetti's Vision 145 series of full displacement yachts designed by Stefano Righini. She can accommodate up to 12 guests in a five stateroom layout. Her interior was designed by Bannenberg & Rowell and includes a central elevator, large entertaining areas and a gym. 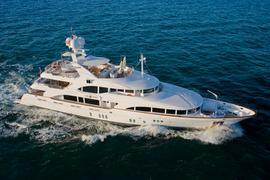 Lying in South Florida and available for inspection, Lady Sheila is now asking €19.9 million, down from €21 million.